This is the third step in achieving financial freedom with an online home business. The first step showed you how freedom starts in the mind; the second step was about following your passion instead of money. There are many different ways to earn money online. Some of these methods give you much more freedom than others. What I will suggest in this article is a method of earning money with your website that requires you to work for a few months without any immediate reward, but pays off later, when there is almost no work required to generate income. 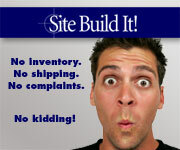 You can set up a website to sell physical products via your existing or new business. Let’s say you want to sell tennis equipment. • The location of your store is not that important, since people can find your website and, consequently, your products through search engines and other websites. • You will have more visitors to your store than just the people who might find its physical location. • You either need to manufacture or buy products and then sell them again. This costs you time and money, and your return on investment is very low. • Someone has to take care of shipping the products to your store from the manufacturer, and someone has to send the products to customers. This, again, costs you a lot of time and money. • Someone has to take care of customer support. If you hire someone to do this, they will cost you money and may not respond to your customers’ needs the way you would want them to. You’ll need to be in constant contact and you’ll never be free. 2. Using advertising networks to sell your own digital products or promote someone else’s physical or digital products. This means that you refer visitors to affiliate programs like Amazon.com and receive a commission on their sales of physical products. You can also refer visitors to merchants who sell digital products and receive commissions on sales, or refer visitors to your own digital products. Your method of referring visitors to the merchants is through paid advertising on Google, Yahoo, Overture and other networks. • You can start earning money in hours of setting up your advertising campaign. • If you use more keywords to bid, you’ll be able to send even more traffic to the merchant sites and receive even more sales commissions. • The competition is often very tough, especially in high-paying niches. Advertising will cost you a lot of money and your return on investment (ROI) may be very low. • Before you master the pay-per-click (PPC) method of advertising, you will inevitably lose a lot of money. Every mistake you make here will cost you money. • You will have to monitor and adjust your keywords, bids and other factors constantly, depending on how the market adjusts the prices and how your competitors adjust their ads. You will never be free. This means creating a large content website that ranks high in the search engines for many different keywords related to the products you want to promote. These can be your own digital products or someone else’s physical or digital products. • Search engine traffic is free. Google, Yahoo and other search engines refer visitors to your website every day without any effort from your side. • There is almost no work needed after the initial setup and promotion of your website – getting links to it. You can occasionally update the website with a new page (perhaps once a week), but you don’t have to stick to any schedule. You can upload four pages in one day and then update the website one month later. • The older your website is and the better its rankings, the higher it will rank in search engines. It will also gain natural links through time and rank even better. • The website becomes your own personal ATM machine, earning money automatically, even while you sleep. Unless you sell your own digital products you have no products to ship, no orders and no customer support. You are free. • You can miss your choice of a niche and build a website that targets a niche too broad that has too much competition, or a niche too narrow that doesn’t have enough demand. Both mistakes are correctable though, once you see how much traffic your site receives daily. • It takes many pages of quality content, lots of initial work in getting links from other websites, and lots of time to make a website start ranking high enough to be competitive. A typical high-traffic website requires more than 100 pages of content and is at least six months old before it can expect more than 300 – 500 visitors per day. • Unless you followed the advice from the second step, to follow your passion, you may lose motivation to keep working on your website for months without getting anything in return. As you can see, you can become financially free and earn money through the Internet in three basic ways, but it is only the last one – building a large, high-traffic authority website – that gives you total freedom for your time and total freedom for your mind. Yes, the initial stage of creating quality content and getting links to the website takes time and and energy, but isn’t this ONE TIME investment of time and energy worth your freedom? I once took a five-day trip to Singapore (departing from Bangkok and coming back), only checked my emails for a few minutes each day, and earned, thanks to the steady income from my websites, $400 more in those five days than I spent on air fare, hotel accommodations, food, and other expenses. If you think that this is the life you want to enjoy and that this is the right path to financial and personal freedom, then let’s discover who can teach you how to build a successful website and which product has proven time and time again that it can over-deliver on the the promise of online success. Very nice summary. Was wondering if you could elaborate a bit about the following: “Both mistakes are correctable though, once you see how much traffic your site receives daily”. How does one correct too little demand? Or too broad a niche? By expanding (“laterely”, so to speak) the topic of his website, perhaps? If your niche doesn’t have enough demand, the yes, you look for closely related keywords and build a keyword list from them. Try kwbrowse.com for finding related keywords. Very simple to use and gives good results. Another is Google Adwords tool where you can also sort relevant keywords by relevancy.